A splash of pink....or rather 3 splashes of pink! Sleek Makeup recently launched blush sets nspired from different vibrant and colorful flowers of spring which are just ideal for this beautiful season. I have noticed that sleek makeup always enthuse from the current weather. You all remember their Berry collection that was just perfect according to that time. 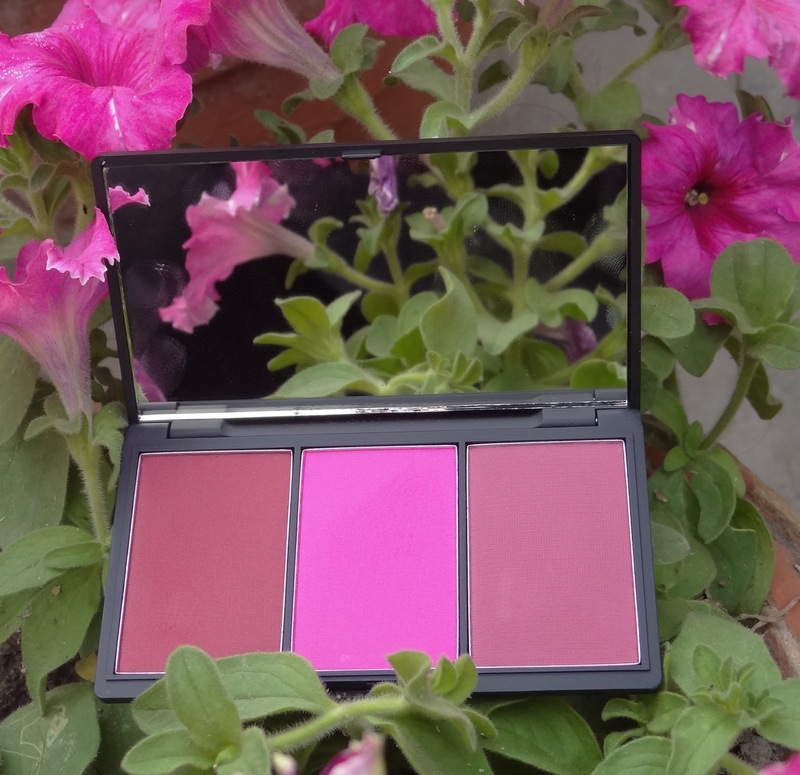 So this time the flowers are not only blooming all around you but on your face too with Sleek Makeup’s limited edition blush set which have so many colors in them. 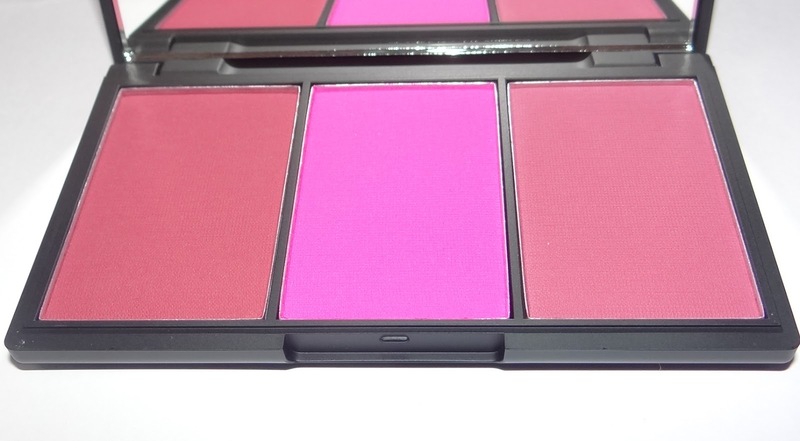 Blush by 3 is a a limited edition palette with erm 3 blushes.Pink sprint is one of the 5 blush set. It contains three beautiful colors in it. All three shades are bright and have a pink touch in them. Blush by 3 is a trio shade blush palette that takes you effortlessly from day to night! Each palette has 3 ultra pigmented shades to choose from in matte and shimmer shades. Use the matte shades for a subtle day time flush, and add the shimmery shade over the top for a touch of night time glamour! With 5 different shaded palettes to choose from , your only dilemma is which one to pick! Choose from Pink Sprint, Pumpkin, Lace, Flame, or Sugar. I'm going to review the second one Pink Sprint. The three colors included in “Pink Sprint” are Pinktini, Pink Ice & Pink Parfait. All three shades are matte in formula. The packaging is quite similar to their eye shadow palettes. 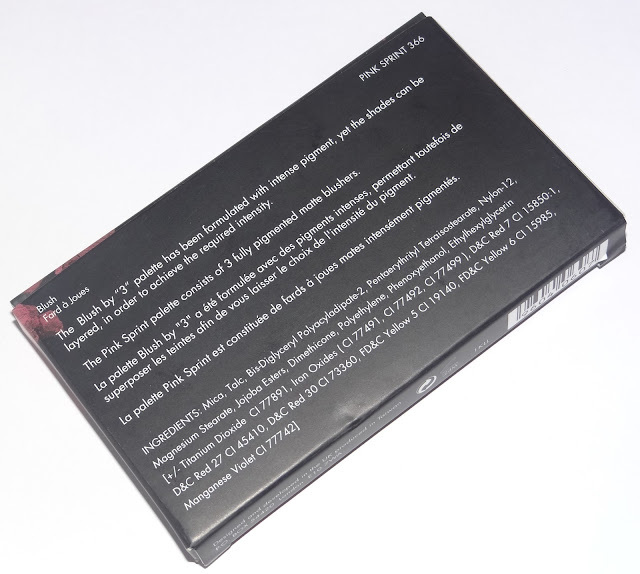 I comes a black outer box with the blush shades shown including the brand name and blush name. You get all the details at the bottom of the package. Inside the box you find a black sturdy and sleek case on which the Sleek makeup logo and product name is printed. We get other details and ingredients in the bottom of the case. After opening the case we find a wide shining mirror with three blushes. There is no applying brush provided with the blushes. I always love the packaging of all the Sleek Makeup's product because they are not only beautiful by looking but are very firm and strong, so easy in closing and opening. They can be carry out very easily without worrying. This blush palette is too very beautiful look wise and firm and strong foe carrying out. The wide mirror provided with blush case makes applying the blushes very easy. I think I have not any suitable words in my dictionary to describe the beauty of all three colors.All three colors are extremely beautiful. Each shade has its own charm and beauty.They look bright at first look but very wearable for all complexions if used carefully. The first shade of this palette is a deep pink berry color. This color is wearable for day and night and has the smoothest feel out of the three. The only caution you have to take with it is using a light hand while applying, otherwise you can look like a clown but if you take it lightly and blend well, believe me, the beauty you’ll pull off, will be incredible. Choice wise it’s the most prettiest color for me. This is a bright fuchsia color and is an ultra pigmented shade. This is such a color, one can just say 'WOW' after a first look. I think it's a perfect blush shade for an Indian or Pakistani bride, If is used with Sleek Makeup Glo highlighter, it'll give a breathtaking effect. This one too needs a light and gentle hand while applying on the face. 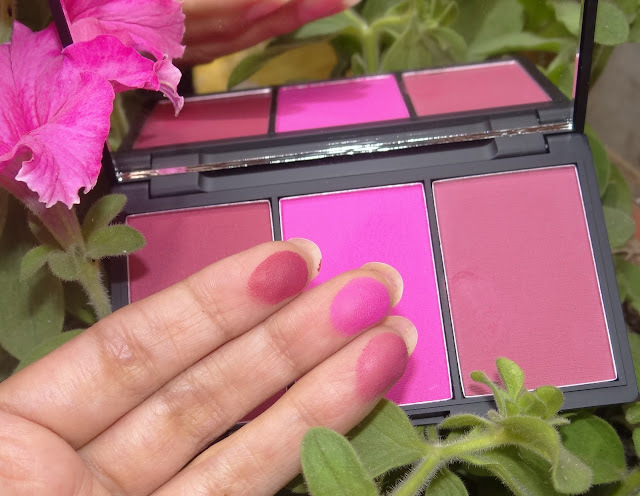 The third color of this palette is a matte Raspberry Pink shade. It has the least pigmentation out of the three but still very pigmented. Probably the easiest to apply without going overboard. Super smooth and blendable. I can wear it with many outfits. they apply with ease but don't break/shatter if anyone is a little heavy handed in using them. You can see their pigmentation in the swatches and can imagine how pigmented they are, but I want to say some words about their pigmentation. The first two shades are super pigmented as you'll fell a bit hesitation to apply them on your face but with a light hands, both look extremely pretty. The third shade is also pigmented but a bit less than the other two. in your brush with a very gentle hand and then apply. In case you have taken much in your brush, apply extra color on the back of your hand first, then only on your face. This is the only caution you have to take with these blushes. After applying these shades with a light hand, the beauty that I got on my face made me really surprised. 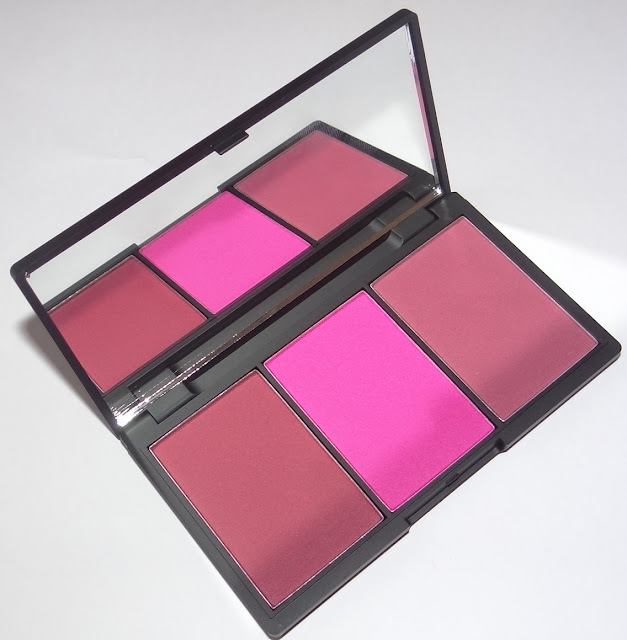 The colors give a magical glow and add beauty to your face which is rarely found with other blushes. Every color gives a different beauty to your face.They blend like a dream come true.After blending they mix with your skin and your face becomes like a flower of maybe rose or pink petunia. I applied all three blushes one by one to see their effect and staying power too. After testing, I was amazed to observe that staying power was stronger than my expectation. I know that most of Sleek Makeup products have very strong staying power but these blushes are incredible. Even in this weather, when the summer is about to come, they can last about for whole day long without reapplying. I didn’t use any face primer or base on my skin before applying them. They are just amazing. The packaging is beautiful, sturdy and firm but very light weight and is very helpful to carry out. A shining wide mirror provided with the case makes application very easy. All three colors are extremely beautiful and get remember you the beautiful spring flowers. The texture is silky smooth and soft. It glides onto the skin smoothly. The blushes are ultra pigmented so very light hand is needed for application. The effect which you get after applying them is tremulously beautiful. The lasting power is just amazing. They even can last for whole day long. The price and quality are excellent and so it's definitely worth the price. All three shades of blushes are matte, I wish at least one was shimmery. There is no brush provided with the palette. I'm very happy with this blush set. Though I'm not very fond of bright color blushes but these are so beautiful that I can't stop myself to apply them on my cheeks again and again because I'm completely satisfied with the effect which I achieve every time while applying them. 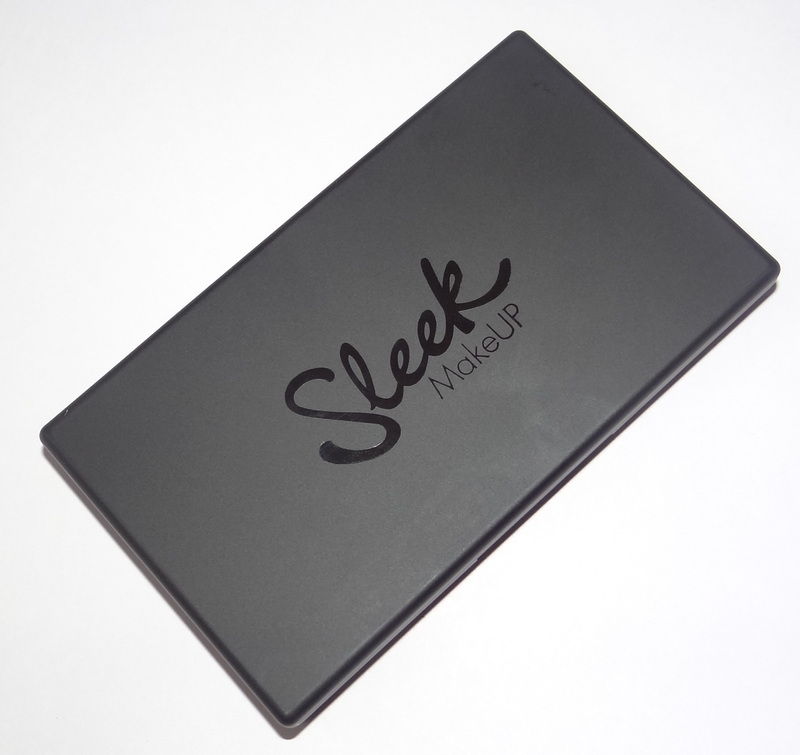 After using several times, I can just say that Sleek Makeup is great! 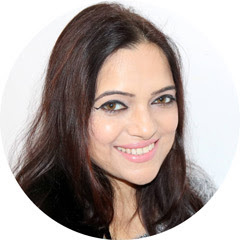 These blush sets are of limited edition so I'll advise to all my readers and friends, Do hurry up and get hold of at least one set because if you are late you can miss them. Disclaimer- Product(s) in the review has/have been sent by PR. Opinions expressed are 100% honest & genuine.